Download your owl image or draw/print out your own. Lay your sweater out on a hard flat surface and put a heavy paper or cardboard inside your sweater to prevent paint and glue leaking through. I used the Martha Stewart transfer paper, however, it didn’t really transfer the image the way I hoped onto the sweater. The transfer paper does work great on paper or hard surfaces. I laid the transfer paper out on top of my sweater. Taped my image on top of the transfer paper. Using a pencil I traced over my image, pressing hard. 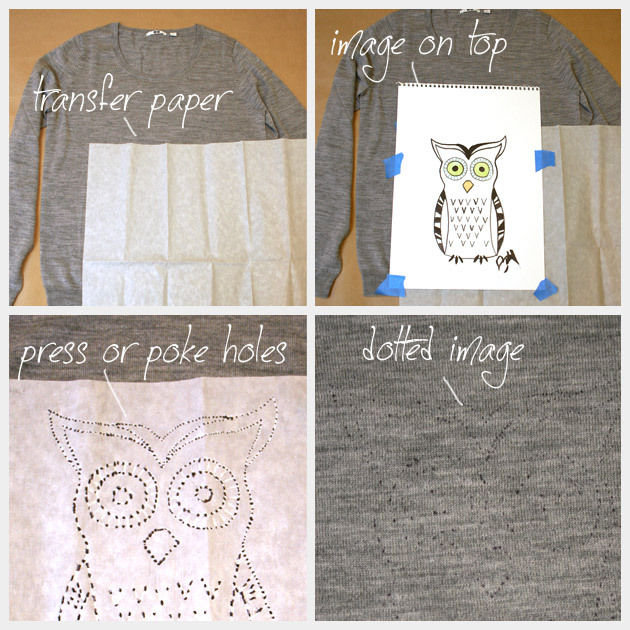 Then (after finding out that I could see my image on the transfer paper but not of my sweater) I took a fine point sharpie and punched holes through the transfer paper, making a dotted outline of my image on my sweater. 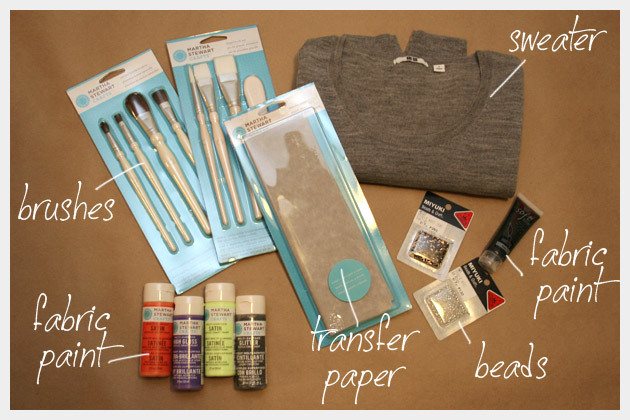 Then take your fabric marker and trace/draw the outline of your image on your sweater. 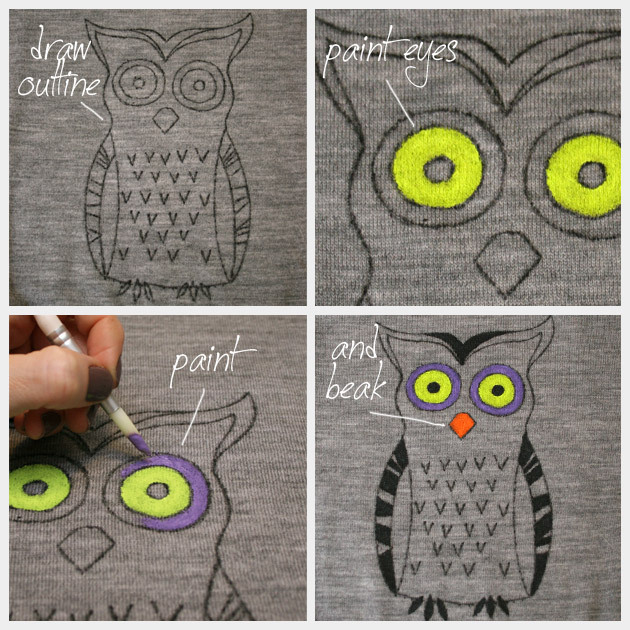 Take your light green (granny smith) paint and paint in the centers of your owls eyes. Paint the outer ring around your owls eyes purple yam. Paint your owls beak orange (carrot). 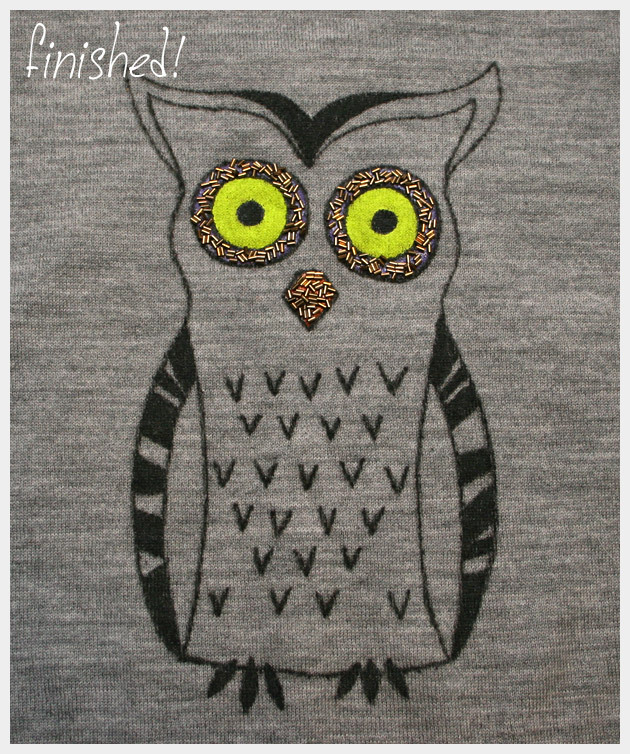 Paint the big “V” on your owls head and the stripes on the wings with your black fabric paint. 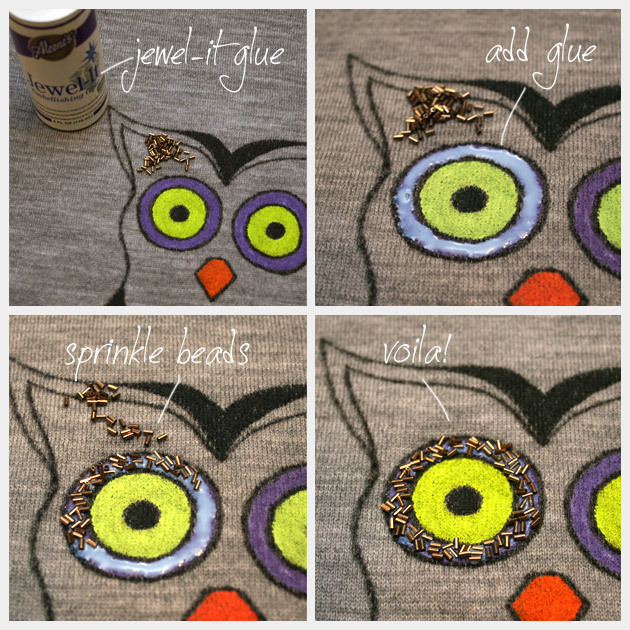 Take your Aleene’s Jewel-it glue and put glue all the way around the outer area (on the purple) around your owls eyes. Then sprinkle your bugle beads on top of the glue. Do this for both eyes and the beak. Leave it to Burberry to make an owl sweater cool. All those gifts of animal sweaters from Grandma that went straight to the back of your closet are so jealous of this Owl Sweater DIY, that Im sure will become a favorite of yours this fall. Once I got the transferring figured out on this project it went really fast and it was a lot of fun too. I was really excited about the way this turned out. All Martha Stewart products c/o of Plaid. I’ve been loving that Burberry sweater! 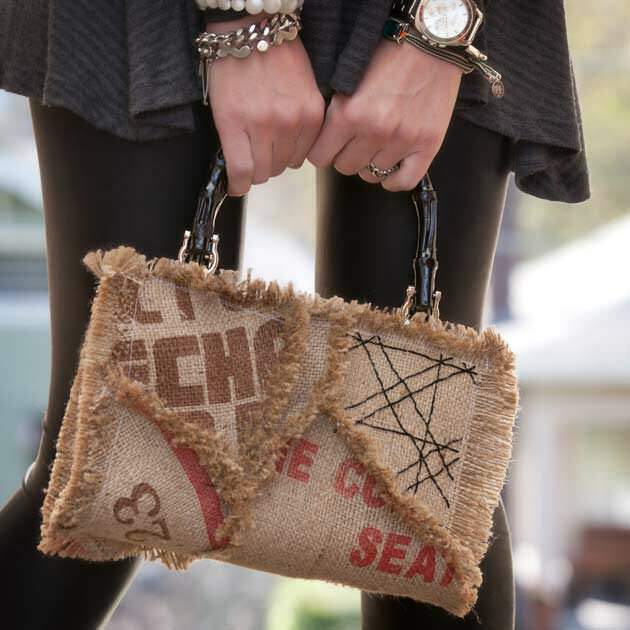 this DIY is simply amazing, thanks for sharing! THANKS A LOT!! you’re grate!! This is absolutely incredible! I love your version and I love how you styled it so similarly to Kate Bosworth’s look! Amazing job! Thank you so much Lia! I’m so glad you like it. I love this and am going to make it on a new short sleeve gray tee i have laying around… However, I do not have a fabrics marker. Do you think I could use a black sharpie? Thanks so much! Yes, I think a sharpie would work fine. Beautiful! My question is about washing, how does it hold up and do the beads stay on? It’s a hand wash only, and the Jewel-it glue recommends that you wait 7-10 days before washing. 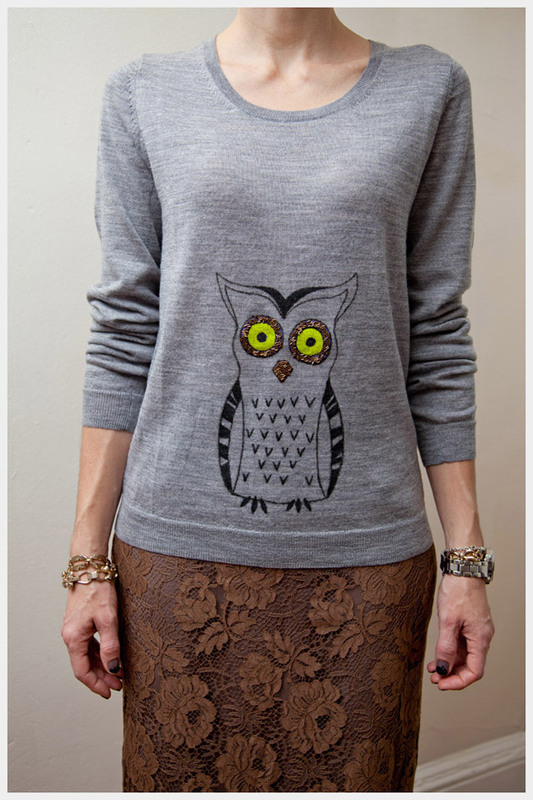 I haven’t washed my owl sweater yet, but I have used the jewel-it before and it holds up really well. I would just recommend being very gentle when you wash it. This is fabulous! 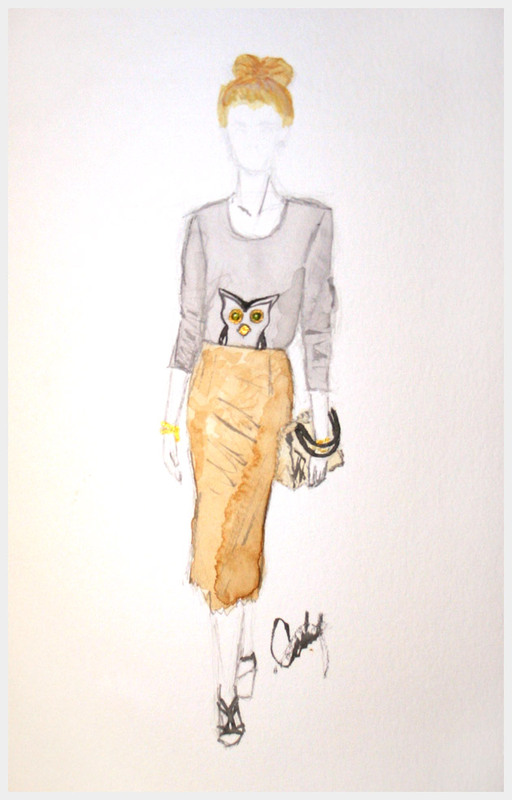 I too have mysteriously been drawn to owls lately. Thanks so much for sharing! I LOVE this. I too see owls everywhere. My son had an old sweatshirt that was too small and me being a thrifty mother of 4 can’t throw anything away decided to cut the neck off and draw an owl on it for my niece. She loves it. Your idea to use the beads would take my project up a notch. Thank you. I love this sweater!!! FAVORITE! This looks great! I had seen the sweater before. Love yours! Awesome!!!! 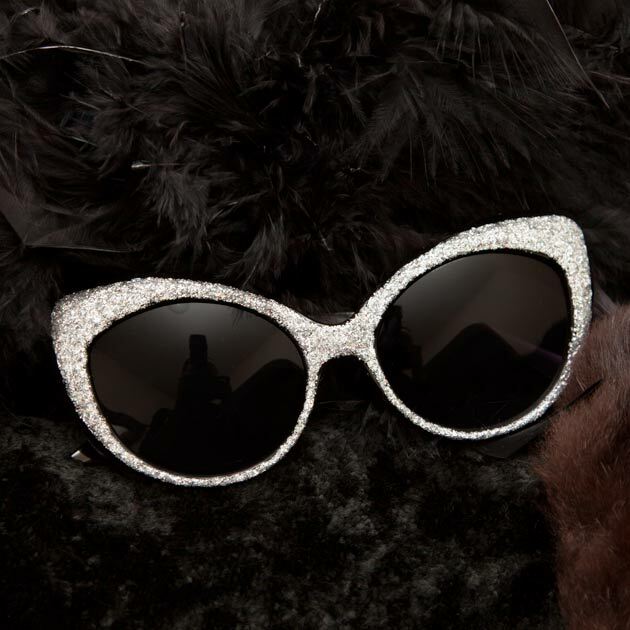 So stylish and so easy!!!! Thank you so much for sharing!!!!! So cute!! It’s Autumn here in OZ so will definitely be trying this DIY out. Thank you!! I absolutely LOVE this jumper! Would you make me one….I would pay you of course!! !